96-year-old Louis Levi Oakes used Mohawk language to encode messages for Allied forces. The 96-year-old veteran from Akwesasne is the last surviving Mohawk code talker, according to the U.S. Congress. During the Second World War, Kanien'kéha (Mohawk language) was one of 33 Indigenous languages used to send encoded messages between Allied forces so that enemies could not understand. Oakes' contributions to Allied forces efforts during the Second World War were recognized by the Assembly of First Nations and the House of Commons Tuesday. Oakes was given a star blanket and beaded medallion by AFN National Chief Perry Bellegarde at an AFN special chiefs assembly in Ottawa. "When you wrap a star quilt around anyone, you're forever surrounded by your relatives, the star people in the heavens, and we've done that for Levi," said Bellegarde. "It's a small gift to say thank you." Oakes' response was short and sweet. "Niawen'kó:wa ki' wáhi," he said, meaning 'Great thanks, indeed' in Kanien'kéha. At 18, Oakes enlisted in the United States Army and served for six years as a technician 4th grade with Company B's 442nd Signal Battalion. He received his training as a code talker training while stationed in Louisiana along with 17 other Mohawks from Akwesasne, a reserve that straddles the Canada-U.S and Quebec-Ontario borders. Oakes served as code talker in the South Pacific, New Guinea, and Philippines. He received an honourable discharge in 1946 and was awarded the Silver Star Medal for his service. It's the third-highest military decoration given in the U.S. for showing gallantry in action against an enemy. After an introduction by the Speaker, MPs in the House of Commons gave Oakes a standing ovation. 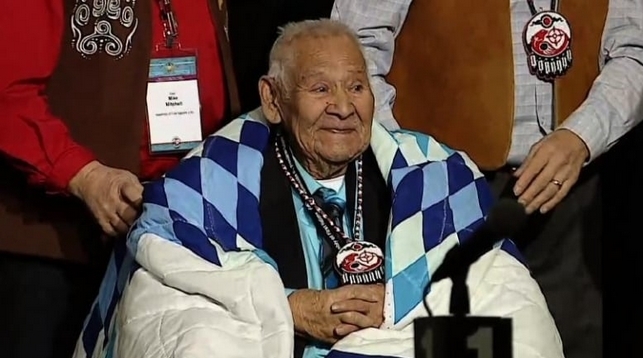 Responses to "Last WWII Mohawk code talker honoured by Assembly of First Nations"